As business laws and regulations continue to change and grow, there is a great demand for accounting expertise. Join an exciting career field where you can combine analytical and detail-orientated work with problem-solving and team environment. At Heidelberg, you’ll receive a solid foundation in accounting principles and practices while also learning the intricacies of management skills. You’ll interact with business professionals, community entrepreneurs, and alumni who’ve built successful careers in accounting and finance fields. Join a team of students who have a strong interest in finance and accounting. The Berg-CFA Investment Challenge Team competes against elite peers from other schools. The team works together to research, write a paper, and then give a presentation to establish a recommendation of buy, sell, or hold on a real company's stock. The team is then questioned and evaluated by a panel of CFA endorsed analysts who judge the competition. Through a connection with Bowling Green State University, every year three Heidelberg accounting majors earn a tuition scholarship and GA position in their Master of Accountancy Program (MAcc). By entering the program, you’ll earn the 150 required to sit for the CPA exam and have access to BGSU’s job placement resources. Accounting is a career that will always be in demand and offers a variety of positions from entry level to executive level. Jobs such as a forensic accountant, internal auditor, certified public accountant, budget analyst, and chief financial officer. Heidelberg's business programs have been awarded full accreditation by the Accreditation Council for Business Schools and Programs (ACBSP). ACBSP accreditation certifies that the teaching and learning processes within the business programs and degrees offered by the Heidelberg University meet the rigorous educational standards established by ACBSP. Please visit College Navigator for student achievement information or review our student enrollment information. Below is a sampling of courses offered in accounting. For more information, see the major requirements. Whitney Bowers, '06, and Logan Weiland, '12, have both found successful careers at Ernst and Young - Logan as a senior accountant and Whitney as a senior manager for indirect tax. 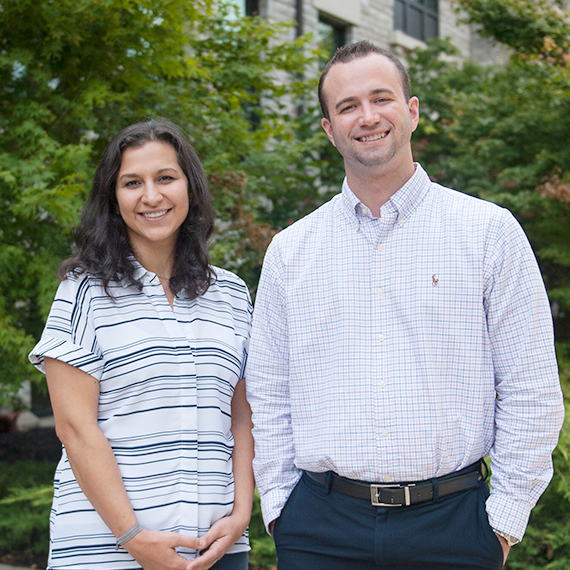 Both are CPAs and credit their success at one of the big four accounting firms to their well-rounded business education at Heidelberg.